Another day in the studio. Progress is being made. I got back into the studio Thursday, took off for the show openings in Dallas Friday, met with TXWAXDallas on Sunday. So Monday was back to the studio day. I HAVE got to get back into the discipline I need for creating. It might just mean spending lots of time just piddling around… or any other thing I could do in the studio. …horrors, cleaning! During the stress times moving and remodeling, I was working by preparing canvases. One or two times I even had a glimmer of an idea or two. 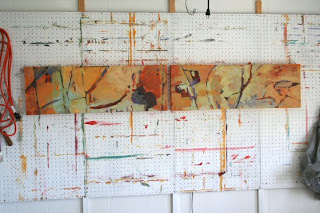 On those days I put a ground and color tone on two long horizontal canvases, both 12 x 36″ long. I just started after that with making a mark. (You have to start somewhere…and this is it for me after the toning). One mark led to another and another with whatever mood the day had for me. These canvases beckoned to me to tone them with a color no longer available from Golden paints…….Quinacradone Gold. I had a big jar and had hoarded it since there was no more. Hey….can’t hoard forever, why have it if not to use? If you’ve noticed, I have a lot of tree line and pasture land outside my windows, both in the house and the studio. They also beckoned to me and the marks made me think of them. This is a recurring theme for me before moving over here though so there is some comfort in making these marks that are symbolic to me I suppose. Next was to decide on a palette of color emphasis. I had the gold tone but you can cover it all up or leave some revealed. So I just started mixing with a blue-green and gold emphasis. The only thing is…my intent goes out the window when I get to painting……..the painting will tell me if it wants to make a detour. I have to harness that impulse if I have a commission that needs certain colors, but without that constraint, I just go with it. This is what I have for now with that diptych which will be measured at 12 x 72″ if left side by side horizontally like this. A possible title came to mind………..Lyric . It was going to be a looking to spring time painting…but something happened along the way to the springtime greens. WOW….I had a wonderful week-end in Dallas. 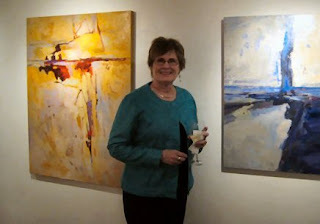 It’s been some time since I got out to visit with people at an art gallery reception. The crowd at the Cerulean Gallery was a lot of fun and they all enjoyed talking with the artists and asked lots of questions. Hopefully it will also be profitable for all of us before the show closes on March 30. 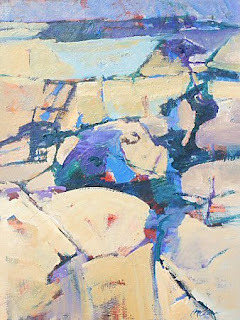 Just before I left for Dallas, I found out an artist friend, Ron Pokrasso, also had a show opening on Saturday night (mine was on Friday night) so my daughter Cyn and I went over to a visit and to see his wonderful work there at Craighead-Green. I’ve had a lot of good feedback from the show so far. This always energizes me to return to the studio. Yaaay…studio time today, finally. Generally, when you have been preparing for a show, you hit somewhat of a lull later and have ‘white canvas‘ syndrome. This has happened to me, but more likely for me is that it frees me to just paint. The show hasn’t opened until tomorrow night, but I had a real disaster on the easel that had a ton of layers on it. I think I have finally resolved this work. Due to ‘acrylic paint death‘ syndrome…(hum..must think of all these syndromes), it might die on me later but I hope not much would have to be done. Hope anyone around Dallas tomorrow night will drop in at Cerulean Gallery on Hillcrest and say hello. Until then, I hope you’ve had a great day in the studio… or, wherever your heart lies! I started out the day, lazing in the bed, thinking, ” I’m going to stay here as long as I want to. I’ve been running for days and need a break! ” Ooops…then remembered that this is my sweetie’s birthday…..and our anniversary on Thursday so I hopped up (you really believe that one :>/) and got in the kitchen, made coffee, and started his favorite homemade from scratch biscuits, scrambled eggs and bacon. This is a fairly new recipe and it has a touch of sugar in it. I have tried to stay away from all this bread and stuff for a lot of years ( I have no will-power it seems). But, now with the new kitchen after all the time without one I’m making all this Artisan bread that I like but he says is ‘okay’ and he loves the biscuits and homemade rolls that I make periodically. Today I’m also making him the “American White Bread” from the Artisan in Five Minutes a Day” book since I have a feeling he might like that kind better. We will see if it sits long enough for tonight…if not, tomorrow. I also went to the grocery store to get rib eyes…none to be had since they were on sale and they ran out. So, he chose chicken fried steak over the Sirloin strip steak. Wouldn’t you know….fried anything. No painting this week like I’d like but MY turn is coming next week after the show opens and I get back from 2 1/2 days away in Dallas leaving him here to fend for himself. Just wanted to let anyone around the Dallas area know I will be a part of a four artist show at Cerulean Gallery opening Friday, February 20. 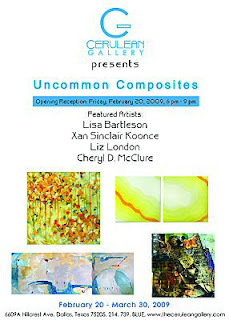 The opening reception is 6-9pm but the show runs through March 30. Do come by and say hello if you are in the area. For more information, Cerulean Gallery.